The Standardbred Race Horse - "Harness Horse"
Originally the "standard" referred to a 2:30 minute mark under which a horse had to trot or pace one mile. 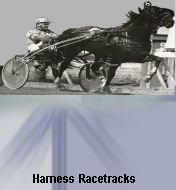 Thoroughbred, Morgan, and Narragansett Pacer blood were combined to achieve the Standardbred. Messenger, a grey Thoroughbred imported in 1788 from England, was the Standardbred's foundation sire. Today's Standarbred has to meet a qualifying time standard to be able to race.